Thomas A. Edison (born as Thomas Alva Edison in Milan, Ohio, U.S., died in West Orange, New Jersey, U.S.) was a famous Inventor from USA, who lived between February 11, 1847 and October 18, 1931. He became 84 years old. Thomas Alva Edison was an American inventor and businessman of Dutch family. He invented and developed many items that influenced the world greatly, including the phonograph and the long-lasting light bulb. The Wizard of Menlo Park, he was baptized by a newspaper was one of the first inventors to introduce the principles known from the mass production of their work and are often awarded the emergence of the first industrial research laboratory. Edison is considered one of the best inventors in history, with 1093 U.S. patents, and many others in Britain, France and Germany. Edison received 1,093 U.S. patents and numerous patents in European countries. All in all, he got about 1500 patents. Thomas Edison's ancestors emigrated from Holland to New Jersey in 1730. When the colonies declared independence, chose Thomas' great-grandfather, John Edison to remain loyal to England, which led to his arrest. Having been close to being hanged, he took with his family and fled to Nova Scotia in Canada in 1784. There, he settled on land that the colonial authorities gave to the people who had been loyal to England. John Edison's grandson Samuel Ogden Edison Jr. (1804-1896) lived from various jobs throughout his life, everything from roofing to work as a tailor and publican. In 1828 he married Nancy Matthews Elliott (1810-1871) from Chenango County, New York. Samuel Edison was not as loyal to the British that his grandfather had been. In 1837 he participated in the MacKenzie rebellion demanding land reform and autonomy from Britain. The rebellion failed. As his grandfather had done before him, Samuel Edison had to flee to save their lives. But contrary to what his grandfather had done Sam went south. He crossed the border into the United States and settled first in Port Huron, Michigan, while he gave up on his wife Nancy and their children remain. Eventually he and his family moved to Milan, Ohio. There were three children, Thomas Edison as the seventh and last child in the family. Thomas Edison began his career inventor in Newark, New Jersey to find the sound recorder and various equipment to improve the telegraph. However, the invention made Edison famous was the phonograph, which he invented in 1877. It was so unexpected that it seemed almost magical. Edison became known as the "Magician of Menlo Park, New Jersey," where he lived. The first sound recorder was made of a cylinder of tin foil. It had poor sound quality and the track was destroyed when it was played, so it could be played only once. In the 1880s, developed Alexander Graham Bell, Chichester Bell and Charles Taint phonograph when they made a cylinder of wax-coated cardboard. The competition with Bell was one of the reasons that Thomas Edison continued to develop its own "perfect phonograph." Thomas Edison died 18 October 1931 at his home "Glenmont" in Llewellyn Park in New Jersey, which he bought in 1886 as a wedding gift for his wife, Mina. Mina died in 1947. 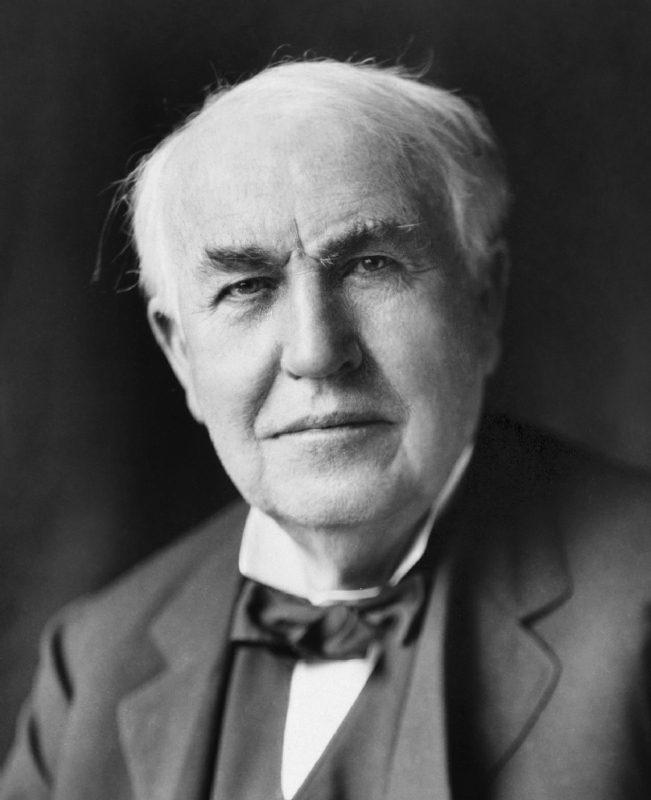 Edison's last breath is reportedly contained in a test tube held at Henry Ford Museum. Ford persuaded to follow the story Charlie Edison to seal a test tube with air from Edison's bedroom shortly after his death. A death mask of plaster were also made. He is born under the zodiac aquarius, who is known for Knowledge, Humanitarian, Serious, Insightful, Duplicitous. Our collection contains 48 quotes who is written / told by Thomas, under the main topics: Business, Friendship, Work. "The reason a lot of people do not recognize opportunity is because it usually goes around wearing overalls looking like hard work"
"There is no expedient to which a man will not go to avoid the labor of thinking"
"The chief function of the body is to carry the brain around"
"The body is a community made up of its innumerable cells or inhabitants"
"When I have fully decided that a result is worth getting I go ahead of it and make trial after trial until it comes"
"What a man's mind can create, man's character can control"
"Waste is worse than loss. The time is coming when every person who lays claim to ability will keep the question of waste before him constantly. The scope of thrift is limitless"
"To my mind the old masters are not art; their value is in their scarcity"
"To have a great idea, have a lot of them"
"They say President Wilson has blundered. Perhaps he has, but I notice he usually blunders forward"
"There will one day spring from the brain of science a machine or force so fearful in its potentialities, so absolutely terrifying, that even man, the fighter, who will dare torture and death in order to inflict torture and death, will be appalled, and so abandon war forever"
"Results! Why, man, I have gotten a lot of results. I know several thousand things that won't work"
"Restlessness is discontent and discontent is the first necessity of progress. Show me a thoroughly satisfied man and I will show you a failure"
"I start where the last man left off"
"One might think that the money value of an invention constitutes its reward to the man who loves his work. But... I continue to find my greatest pleasure, and so my reward, in the work that precedes what the world calls success"
"Non-violence leads to the highest ethics, which is the goal of all evolution. Until we stop harming all other living beings, we are still savages"
"Nearly every man who develops an idea works it up to the point where it looks impossible, and then he gets discouraged. That's not the place to become discouraged"
"Maturity is often more absurd than youth and very frequently is most unjust to youth"
"Just because something doesn't do what you planned it to do doesn't mean it's useless"
"It is astonishing what an effort it seems to be for many people to put their brains definitely and systematically to work"
"I never did anything by accident, nor did any of my inventions come by accident; they came by work"
"I know this world is ruled by infinite intelligence. Everything that surrounds us- everything that exists - proves that there are infinite laws behind it. There can be no denying this fact. It is mathematical in its precision"
"I have friends in overalls whose friendship I would not swap for the favor of the kings of the world"
"I find my greatest pleasure, and so my reward, in the work that precedes what the world calls success"
"I am proud of the fact that I never invented weapons to kill"
"His genius he was quite content in one brief sentence to define; Of inspiration one percent, of perspiration, ninety nine"
"Hell, there are no rules here - we're trying to accomplish something"
"Great ideas originate in the muscles"
"Being busy does not always mean real work. The object of all work is production or accomplishment and to either of these ends there must be forethought, system, planning, intelligence, and honest purpose, as well as perspiration. Seeming to do is not doing"
"Be courageous. I have seen many depressions in business. Always America has emerged from these stronger and more prosperous. Be brave as your fathers before you. Have faith! Go forward!" "Anything that won't sell, I don't want to invent. Its sale is proof of utility, and utility is success"